I had to attend a funeral last night... for a fish. Yep just before 10pm last night my son's pet Siamese Fighting fish was pronounced dead and our household was turned upside down. At first there was utter disbelief.... i think they call it the denial stage. After getting the kids into bed late, I was turning off Sam's bedroom light when I noticed his fish was kind of doing this floating on its side thing in the bowl. "No he just sleeps like that" was his disbelieving response. After a bit of a prodding with a pencil it was determined that nope - this fish definitely wasn't catching up on any sleep. Reality hit and the crying started... oh Lord THE CRYING! 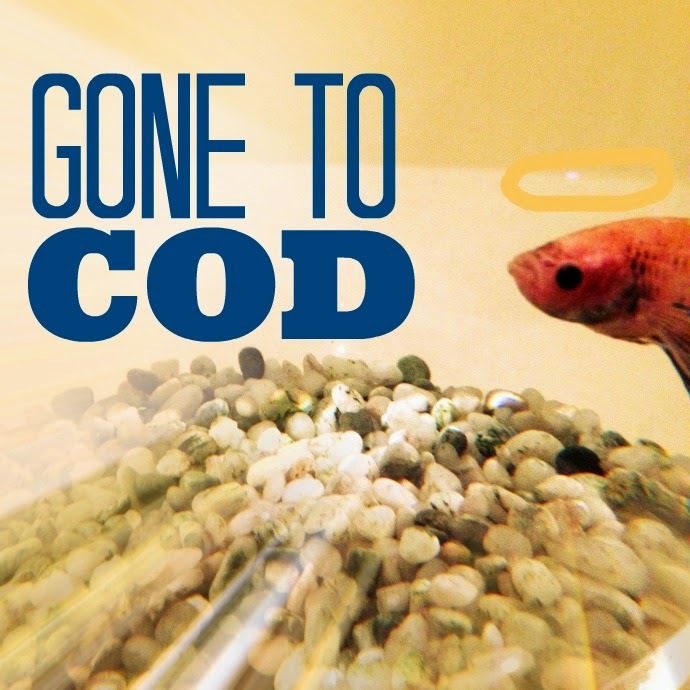 It was like my poor boy's limbs had been stolen from his body rather than the passing of his beloved fish. His raw heartache turned my own heart to mush and there was nothing I could do to ease his pain... except give him some time alone with the sideways floating fish to say his goodbyes whilst I gathered the rest of the family together for the funeral. During the funeral planning process, Sam was given the option of a burial, cremation (fire pit) or sea burial (aka a flushing). He decided that the sea burial was probably the most peaceful and fitting way to send off his friend. He asked me if I would sing at the service and so I promptly went into panic mode trying to think of an appropriate song to warble. All I could come up with was that "I'm on top of the world, looking down at creation" song and somehow it just didn't seem quite right. We settled on Amazing Grace, although once the eulogy was underway the singing part was forgotten about and I was off the hook. Thank God... I'm not sure I would have made it through the song without cracking up. The eulogy was beautiful... and by beautiful I mean as beautiful as you can get when it comes to a eulogy for a fish. After leading us in doing the sign of the cross, Sammy launched into a moving tribute to his scaly friend. He shared stories of how his fish - Gilly - was such a loyal friend, how he used to help Sam do his homework, watched movies with him, watched over him whilst he slept and even played games with him. Curiosity got the better of me with the games bit and I couldn't help but interrupt the service to ask what games they actually played. Apparently, Gilly's favourite game to play was the Angry birds dice game. Sam obviously had to roll the dice for the both of them but Gilly was really good and used to win pretty much every time. It was at about this point our oldest son was kicked out of the service for laughing even though he swears he just had something in his eye. I couldn't get too mad at him though as I too had something in my eye and my hubby clearly had a frog in his throat. It was seriously so hard to keep a straight face through this epic ceremony. Once all the formalities were complete, Sam unwrapped the toilet paper that Gilly had been carefully wrapped in and ceremoniously tipped him into the toilet. Unfortunately Gilly hit the side of the toilet bowl and got stuck there and so Sammy with an "Oh God this is not good" had to stick his hand into the toilet to unstick him. It wasn't exactly the dignified farewell he had planned. Finally, Gilly was in the water and Sam was given the go ahead to use the full flush button and send Gilly back to the big ocean in the sky. And that was it. The funeral came to an end. And as Debora on Facebook said - "Gilly had gone to Cod" Bada boom! A new fish joined the family today. My Mum kindly took Sam to the pet store after school so that he could choose a replacement fish friend. It was a lovely thing for her to do for her Grandson, although I am not entirely convinced it wasn't done partly out of guilt given she too cracked up when Sam rang her on Facetime to break the news and tell her all about the funeral. Welcome to the family Fred. Please stick around a while as we've had enough drama for one week! Have you had to sit through any dramatic pet funerals?